I arrived back in Copenhagen late last night on delayed flight from Barcelona and the 2006 version of the GUADEC conference. Actually, the conference took place in Vilanova i la Geltrú, 45 km south of Barcelona. The GUADEC (GNOME Users and Developers European Conference) and GNOME, for the uninitiated is the acronym for “GNU Network Object Model Environment” the full name of which people rarely use anymore. Actually, GNOME is a Free Software Desktop Environment – which means that it is a wide collection of different elements that seek to make the user experience of the computer as smooth as possible. Just like the Linux kernel or the X-Window system, GNOME is an central part of many Linux distributions such as Red Hat, SuSe and, of course, Ubuntu. It is worth noting that GNOME is not the only Linux desktop environment available. There is also KDE (for the K Desktop Environment – very creative name, yes?) along with many others. For KDE users, there is a now a separate version of Ubuntu awkwardly named Kubuntu which is based on KDE rather than GNOME. Anyway! Before this all but drowns in strange geeky acronymics (and to be sure, there’s a lot of that going on), I’ll tell you about the actual conference. I went there to get an impression of how one of the older Free Software projects (the GNOME project was begun in 1997) works socially and organizationally compared to Ubuntu. The conference was a very different event compared to the Ubuntu Developers’ Summit. It is much more of a community-driven event, organized by volunteers and dedicated members of the GNOME community. Sure, there are lots of corporate sponsors and keynotes and workshop discussions, but everything seemed much more relaxed and unhurried. There were no results that had to be reached. No specifications that had to be written. It was just a good, social occasion for people to meet and have fun. It had a unmistakable feel of geek summercamp about it, with people going to the beach, sitting and hacking in good humour, hanging out. 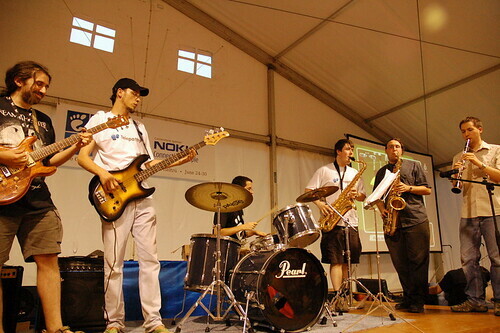 There was even a football tournament (“the FreeFA World Cup”), sponsored parties and live music with the GNOME band! I didn’t actually get to take any pictures at the GUADEC, but luckily almost everybody else did. It seems that almost every geek present had a digital camera, and quite a few had really big expensive ones as well. It seems that photography is popular hobby among geeks. At the time of writing, more than 1700 pictures on Flickr has been tagged GUADEC2006, and just by flicking through a few of them, you’ll get a good idea of the smiley, relaxed atmosphere there. (also, the two pictures presented here are linked from Flickr). At the same time, there was an intense amount of posting on the aggregated Planet GNOME blog feed that collects blog posts from lots and lots of GNOME developers. It is definitely another good way to get a feel of the atmosphere at the conference. Compare to the Ubuntu Summit was called, arranged and sponsored solely by Canonical, the company employing the Ubuntu core developers, with an intense working schedule with workshops from 9 am to 6 pm every day and having to sneak in the social time after that and cut down on sleep instead. Actually, at GUADEC people also cut down on sleep, in a way that left most people absolutely exhausted at the end of the full week of conference. 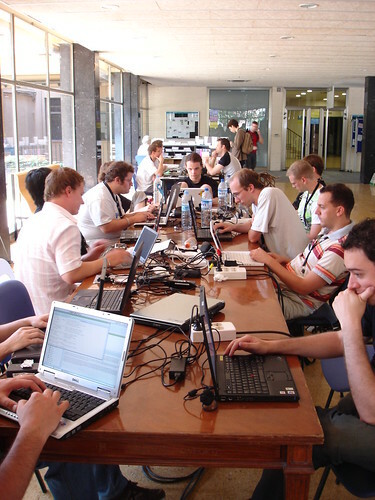 Oh, and photos from the Ubuntu Summit has been gathered here. Including a very nice group photo. I unintentionally managed to end straight in the middle of the photo. A key to who the rest of the participants are can be found here. Also, compare the playful banter of the planet GNOME with the more sober tone among the posters at the Planet Ubuntu blog feed. Also, note the small overlap of posts. I especially recommend the Ubuntu Quality Assurance guy (“bug hunter”) Simon Law’s blog posts which does well to capture the duality of the conference: Trying to both do hacking stuff and have time for social interactions and adventures in Paris.